HRD Antwerp will be certifying all diamonds from the Shape of Antwerp, the new diamond jewellery collection that will be sold exclusively on the Chinese e-tailer Alibaba’s Tmall platform: Belgian Diamond Pavilion, the lab announced yesterday. The Shape of Antwerp brand is the result of a new partnership between the Antwerp World Diamond Centre (AWDC) and Alibaba Group and will be showcased to consumers both online as well as at the China International Import Expo (CIIE) this month as well as sold exclusively on Alibaba’s Tmall platform: Belgian Diamond Pavilion. The jewellery has been designed by a select group of master jewellery designers, and uses HRD certified diamonds from Antwerp in a range of designs. Each certified diamonds will have a QR code laser engraved onto the girdle before it is set in a Shape of Antwerp design. The tamper-proof QR code is also included on the diamond’s grading report, HRD said. 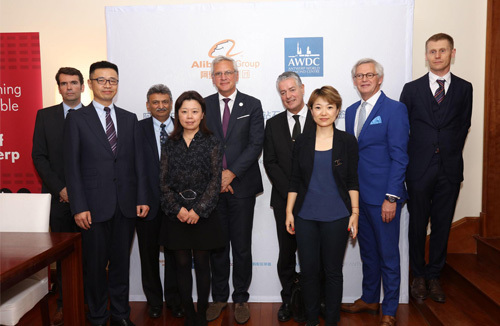 The Memorandum of Understanding (MoU) was signed at the Belgian Consulate General’s residence in Shanghai by Nishit Parikh, Chairman of AWDC; Jessica Liu, President of Tmall Fashion and Luxury; and Michel Janssens, CEO of HRD Antwerp; in the presence of Kris Peeters, Belgian Deputy Prime Minister and Minister of Economy and Employment; Jet Jing, President of Tmall.